The Aimpoint® Carbine Optic is designed specifically for use on AR-15 and M4 carbine style rifles, incorporating proven design features and premium Aimpoint quality at an entry level price point. This new sight was developed with the modern sporting rifle owner in mind, and the ACO is ready to mount and shoot directly out of the box. A full selection of branded accessories, are available from Aimpoint dealers, allowing users to customize their sight to fit their specific requirements. The ACO pairs a 30mm aluminum alloy sight tube with an extremely rugged fixed height mount designed to provide absolute co-witness with AR-15 backup iron sights. 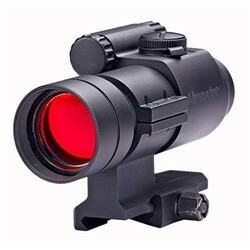 A two minute of angle (2 MOA) red dot is utilized to allow maximum target acquisition speed and accuracy at all distances. The ACO is completely waterproof, and offers one year of constant-on use from a single 1/3N battery.